Have you received a fibromyalgia diagnosis? Many people who ultimately end up with a fibromyalgia diagnosis spend from five to ten years going to various doctors to get a proper diagnosis. It is estimated that up to 5% of the world’s population has fibromyalgia, yet many are undiagnosed, many are misdiagnosed, and many still are searching for better answers to understanding and treating the myriad of symptoms. NOTE: On October 1, 2015, Fibromyalgia became recognized as a REAL and official diagnosis. This represents a big step forward here in the USA health care system and for other countries to follow suit. The new diagnostic billing code for fibromyalgia is M79.7. Or as I like to say .."Fibromyalgia now has its own zip code!!" Yes, fibromyalgia really does exist. With new diagnosing methods, the patient will be known to have pain and symptoms for at least three months. 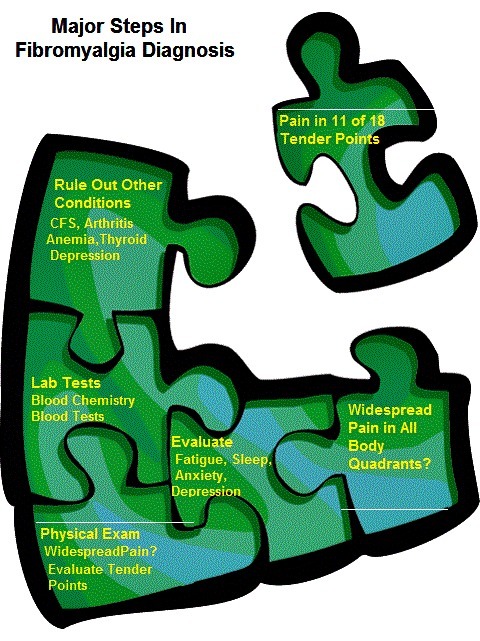 The WPI (widespread pain index) will require at least a score of 7 or higher to diagnose fibro, while the SS (symptom severity) test with require a score of at least 5 or higher. The average person with fibromyalgia lives with symptoms for many years before diagnosis which can lead to confusion, increased isolation and even depression. That said, we also have to be very careful about mis-diagnosis. The reason being that when more people are mis-diagnosed, it becomes more challenging to bring "accurate awareness" to fibromyalgia. And this can impede the proper treatment for any other illness present. Another problem is self-diagnosis. A "self-diagnoser" is often one of those well disguised scammers who will try to sell you on the latest product to "cure" your fibromyalgia. Or, many times it is someone who actually self-diagnosed a long lasting pain as fibro and "cured" it with Blue EMU or some other cream. Then, they set themselves up as experts on fibro and recommend or worse, sell the cream as a fibro cure! I've seen this many times and actually had them come to my Facebook pages and comment that they had a cure! A formal medical diagnosis is critical. Here at LSWF, we offer many suggestions, solutions and lifestyle support while living with the complexity of fibromyalgia and related conditions, but never false cures. There are many pain syndromes, but fibromyalgia itself is unique and multi system, not merely pain, and that is why proper diagnosis is essential. A fibromyalgia diagnosis should follow the 2016 modification to the 2010 American College of Rheumatology (ACR) guidelines. The 2016 modification allows a diagnosis of "fibromyalgia" without the time consuming elimination of other diseases which can mimic some of fibro's symptoms and was a major factor in the 4 to 5-years to get a medical diagnosis of fibromyalgia in the past. 1) If not done, this can lead to the misdiagnosis that we often see. For those who do have fibromyalgia confirmed by thorough diagnostic testing, it can be some relief to know that it is not in their head and they can start to better understand this multi-system illness and all of it's complexities as well as the best way to approach recovery. That's what this website is all about. Also refer to link at bottom of page for article on "fibromyalgia symptoms". There are various doctors that can give patients a fibromyalgia diagnosis: a rheumatologist, naturopath doctor, neurologist, integrative medicine doctor or chiropractor. Yet the really important point here is that the doctor that diagnoses your fibromyalgia does not have to be the same doctor that TREATS your fibromyalgia. If your treating doctor is merely throwing drugs and muscle relaxants at your fibromyalgia without treating the underlying issues, then any recovery or greater levels of healing will continue to be impeded. Fibromyalgia requires an experienced medical team and a multi-faceted approach to symptoms control. It needs to be understood by doctors and patients alike that treating fibromyalgia properly includes using a multi-treatment approach. Lifestyle changes are in order. Read my Home page carefully to get a feel of what’s involved. If at any time a fibro patient is hesitant to talk openly about all of their symptoms, or the doctor tends to dismiss the myriad of symptoms as if he/she has ‘heard it before’, then it might be time to ‘fire’ that treatment plan or doctor and move on. And what about family and friends who are skeptical when you announce the diagnosis of fibromyalgia? It can be difficult for family members and friends to accept and support a diagnosis of an illness that is still widely misunderstood. It is actually quite normal for patients to go through various periods of non-acceptance and wondering who it might be safe to share with. I still believe that the best way to help a spouse, family member or friend to better understand fibromyalgia is to give them time, the best education, and to also show that we are exerting a degree of proactivity within our wellness. Are we doing all we can to ‘live smarter’ with fibromyalgia? See, there are still many myths about fibromyalgia in the media today. This makes it even more challenging to get the right information to those who need it. Just telling a friend or family member to ‘research it’ is not a good idea. Refer to my Fibromyalgia Resources page for books on fibromyalgia. Sometimes a third party is needed to intervene and help to gain better understanding of the illness itself and the best ways to support. It can be very challenging for a family member to learn how to be supportive of someone with fibromyalgia and all of it's complexities. Things will need to change in order to create an environment of support and wellness; often, this takes time. The good news is that with the right tools and support, the fibromyalgia patient and those who care about them can learn to live a much better and more functional life. My own success led to my desire, even passion, to share what works here on the website. We have to gain a new perspective, stop wishing for what was and start accepting and mastering what is here now in front of us. For further directly relevlant information, click on Fibromyalgia Symptoms and the interactive Extended Symptoms List. For a thorough report on obtaining disability SSI payments in the U.S. click on Fibromyalgia disability and evaluation. Also, for additional info and support groups in your area click on National Fibromyalgia and Chronic Pain Association.